Photo by Samantha WardCongratulations to Samantha Ward of Albuquerque, New Mexico! This photo of Mr Sunolena Letters circling a cow won this week’s Omega Alpha Equine Quarter Horse News/Horsecity.com Action Photo Contest. 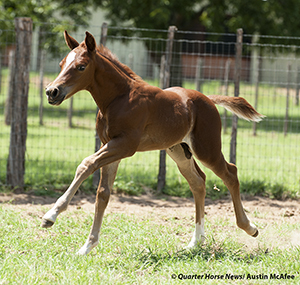 High Brow Cat's clone, pictured at two weeks old.A clone of all-time leading cutting horse sire High Brow Cat arrived the evening of July 3 and has enjoyed the first couple weeks of his life in good health at Weatherford Equine Breeding Center in Weatherford, Texas. At McQuay Stables in Tioga, Texas, the focus has long been on exceptional performance - both human and equine. But people close to owners Tim and Colleen McQuay know that underlying all the awards and accolades the couple's real focus has always been the love of the horse. So, losing any horse would be hard. But saying goodbye to a great one pushed the difficulty to another level when Colonels Smoking Gun, known worldwide simply as "Gunner," lost his battle with laminitis on July 8. The National Reining Horse Association (NRHA) Hall of Fame inductee and $5 Million Sire was humanely put down after spending the last week at Equine Medical Associates in Pilot Point, Texas, under the constant care of Dr. John McCarroll. Kentucky regulators have begun investigating the use of shock wave therapy in racehorses amid concerns that the treatment could be used improperly as a performance enhancer. Read more at The Paulick Report.